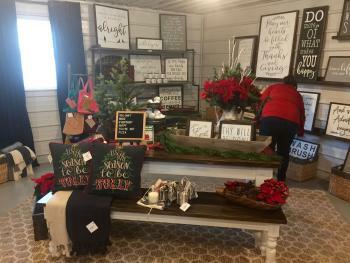 A new store has arrived in Hendricks County, and if you&apos;re looking for handcrafted signs, gifts or home decor, you definitely want to take a quick drive to Lizton to check out Norelu Designs. Norelu opened on Sept. 30 and is owned and operated by Brooke Canada and her husband, Josh Gordon. The shop name, pronounced "No-Ray-Lu," comes from the names of their three kids: NOlan, REgan, and LUke. 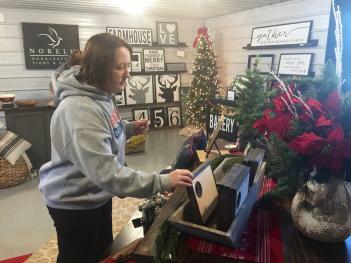 Brooke hails from North Salem while Josh comes from Brownsburg, and they currently reside just outside of Lizton where they create their popular hand-crafted signs and gifts in their home. Brooke has more than 20 years of graphic design experience, while Josh is an accomplished woodworker, so they&apos;ve combined their talents to make Brooke&apos;s longtime dream of Norelu Designs a reality. The shop is located at 103 W. Main St. in Lizton, at the southwest corner of the intersection of Ind. 39 and U.S. 136 (the four-way stop). If you&apos;re familiar with where the Lizton Dairy Bar is located, go directly south across U.S. 136, and there&apos;s Norelu. Inside the little shop with the black square sign out front, you can find a treasure trove of handmade signs and gifts. Josh comes home every night from his full-time job in downtown Indianapolis and heads straight to his workshop to create the blank signs in a wide variety of sizes for Brooke to add her artistic magic. They then take the finished signs to the shop where they fly off the shelves. Josh and Brooke put in long hours each day to keep their store stocked, given the incredible popularity of their products -- especially during the holidays. Josh made several sales in the relatively brief time I was there talking to him. They hope to take a short break after the holidays to recuperate, but right now, it&apos;s full steam ahead. And they&apos;re not mass-producing cheap signs as quick ly as they can slap them together. Far from it. "We hand-make every single sign as if we&apos;re going to hang it in our own home," Josh said. "There is a lot of blood, sweat and tears in each sign. It&apos;s definitely a labor of love for us." The painstaking care they take in creating each sign shows in the quality of their products. Their family values and sense of humor also come through in both their signs and in their interactions with shoppers. 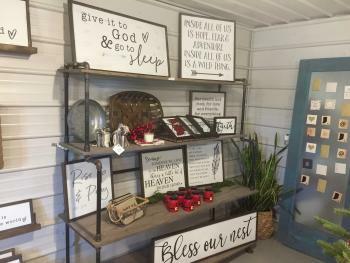 Some signs in the shop celebrate pertinent, motivational and uplifting Biblical scriptures. Others promote the importance and love of family. They also sell signs featuring song lyrics, such as snippets from Tom Petty&apos;s Mary Jane&apos;s Last Dance and Bob Marley&apos;s Three Little Birds. Of course, at this time of year, there is plenty of holiday decor available for purchase, too. All of it makes for wonderful gifts or as a way to decorate your own home. If you have an idea for a sign and can&apos;t find it inside the store, you can place a custom order through Norelu. Just be aware that at this point in the holiday season, custom orders will not be completed by Christmas. "We currently have about 60 custom orders that we need to fill right now, which puts us into late January or early February," said Josh. "It keeps us really busy, but we love it." Josh stresses the importance of visiting Norelu often because their signs move so quickly that their selection differs every day. The shop opens at 10 a.m., and I was there around noon. While I was there, a woman bought the last of a particular sign that Josh said he had just stocked that morning. He hadn&apos;t even had a chance to advertise the design on social media as being available before he sold out. "Looks like we&apos;ll be making more of those tonight," he said with a smile. It&apos;s definitely worth a visit to Lizton to check out Norelu. The shop is clean and quaint. My wife reports that their prices are quite reasonable, Josh and Brooke are very friendly, and the whole shop smells like freshly-cut wood. Go see them! 103 W. Main Street, Lizton, Ind.